A close relative of the Mamey Sapote is a native to the highlands of Ecuador. 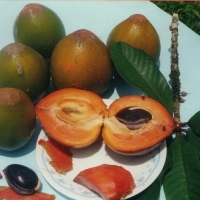 The tree has smaller, darker green leaves than the mamey and has a superior flavour and finer texture. The dark dull green fruit turns to gold when ripe and the thick orange flesh has a 'melting in your mouth' effect. The seeds are edible when roasted and have been used as an adulterant to Chocolate.